NEW YORK (TheStreet) -- Predicting the 2016 election is guesswork, but predicting which television broadcaster will attract the most political advertising dollars doesn't have to be. Analysts say political campaigns, political action committees and SuperPACs will still pay a premium for two things: best-in-market news programs and affiliate stations in states with the most closely-split electorates. Local broadcast television is expected to get the largest slice of record political ad-spending in 2016 even as advertisers shift more of their budgets to digital channels. But broadcasting groups with holdings in so-called swing states will have a better chance of tapping into high demand from political campaigns, said Elizabeth Wilner, general manager of Kantar Media's Campaign Media Analysis Group. "If you're a political advertiser and you want to reach people in Columbus, Ohio, you're most likely buying space from a local station and for a local audience," Wilner said in a phone interview. Television broadcasters and their investors are certainly expecting a windfall from political spending over the next 15 months. During the 2012 presidential election, political ads accounted for 21.2% of revenue at Gray Television (GTN - Get Report) and 21.7% of combined net revenue at Media General (MEG, according to company regulatory filings. Gray is scheduled to report its second-quarter earnings on Aug. 5, and Media General on Aug. 6. Next year, political ad-spending is expected to reach an all-time high of $4.4 billion, according to Kantar Media's Campaign Media Analysis Group. Of particular interest to network affiliates is Kantar's forecasts that about 75% of that sum will be used to buy space during local television broadcasts. That's because local prime-time slots remain a dependable way to reach undecided voters, said Moody's senior analyst Carl Salas. The number one news program in a given market tends to account for about half of all political ad-sales, he added. "Gray is one of the best at this," Salas said in a phone interview in New York. "Not only are they in the battlegrounds and in the capitals, but check this out: Gray is typically number one in its market and number one in news." According to regulatory filings, Atlanta, Georgia-based Gray boasted the largest or second largest local news audience in 41 of its 44 markets as of February 2015. Salas noted that McLean, Va.-based Tegna (TGNA, which assumed the television holdings of Gannett (GCI - Get Report) when the publisher split in April, and Richmond, Va.-based Media General also tend to have affiliates with top-ranked news programs in swing districts. In 2012, Gannett television affiliates in Florida and North Carolina covered the Republican national convention in Tampa and the Democratic national convention in Charlotte helping fuel the company's record political advertising revenue of $150 million. Media General has credited record political ad sales in 2012 to well-placed television stations in Iowa, Michigan, Virginia and Wisconsin. Early advertising during the primary elections is expected to be especially high from 2015 into 2016, Salas said. Not only are there no incumbents in this year's race, but participants in the August 6 primary debate on Fox (FOXA, the first for this upcoming cycle, will be limited to the top 10 Republican candidates out of a current field of 16. "The more candidates you have initially, the more these candidates will be advertising," said Salas. "And if the proposed debates are going to be limited to [candidates polling in] the top 10, then there will be even more demand." But there's a downside to a long primary season. If the primary elections stretch into June, political advertisers may only purchase ads in a handful of local markets rather than national prime-time slots during events such as the Olympic Games, which begins August 5, 2016 on Comcast's (CMCSA - Get Report) NBC. "If Republican candidates run out the primary until June, we have lost the opportunity to max out revenue" for the fourth quarter, E.W. Scripps (SSP - Get Report) vice president of sales Michael O'Brien told the Cook Political Report last week. In 2012, political advertising at Scripps accounted for 11.8% of operating revenue. "Most of the premium money on a presidential election is done once you have the candidates selected," said Moody's Salas. "If the Republicans are still trying to figure out who their candidates are going to be, the Democrats will sit back and wait for the Republicans to duke it out." Political advertising spending continues to be focused on broadcast TV despite larger marketing trends showing ad dollars shifting to cable-TV and digital channels. Borrell Associates, a Williamsburg, Va.-based research and consulting firm, says broadcast television will account for 52.6% of total political ad spending in 2016. By contrast, data from the Interactive Advertising Bureau shows that broadcast television accounted for 23.5% of overall advertising revenue in 2014. But some expect the dominance of network advertising to erode during this election cycle. Networks already tend to command bigger advertising premiums than cable channels because they have larger audiences, but having so many campaigns compete for limited prime-time advertising space on broadcast television could nudge premiums even higher and bump some political advertisers to other options, said Brent McGoldrick, CEO of Deep Root Analytics. "Many times that means buying cheaper, less expensive local cable, as it's reaching the same audiences, rather than advertising on a prime-time local affiliate broadcast," said McGoldrick, whose firm specializes in buying ad-space on behalf of Republican causes based on custom data rather than Nielsen ratings. "If you thought you were safe from political ads by switching to cable TV, in 2016 that's no longer the case." McGoldrick said Senator Mitch McConnell's 2014 reelection campaign went from purchasing space on 18 local cable channels to buying time on 34 after Deep Root Analytics calculated that it could save money by switching from broadcast to cable. 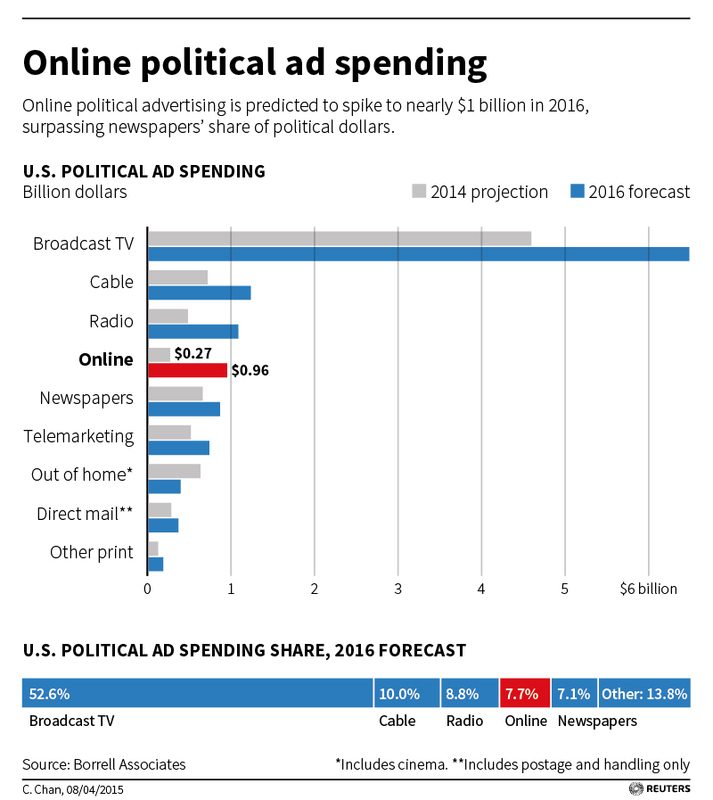 Kantar's political ad-spending prediction for 2016 is well above past election years while the Wesleyan Media Project estimated total election-related ad spend to be $2 billion in 2012, less than half of the projection for 2016. Besides a lack of incumbents and an abundance of Republican primary candidates, Kantar predicts that political ad-spending will get a $500 million boost as a result of the Supreme Court's Citizens United decision, which has spawned the formation of so-called SuperPacs that can receive unlimited donations from corporations and labor unions.